We have just finished another week of our BOOTCAMP HOLIDAY training with our most recent group clients. Our intensive training program this week has consisted of 3 BEACH BOOTCAMP Classes on Monday , Wednesday & Friday starting each day at 07:30 on Puerto Colon Beach. This week our classes were High Intensity Body Weight Training including press ups, squats and burpee jumps over a distance of 30 metres. This is a great form of training for anyone looking to Lose Weight, Tone Up and improve your cardio fitness levels. 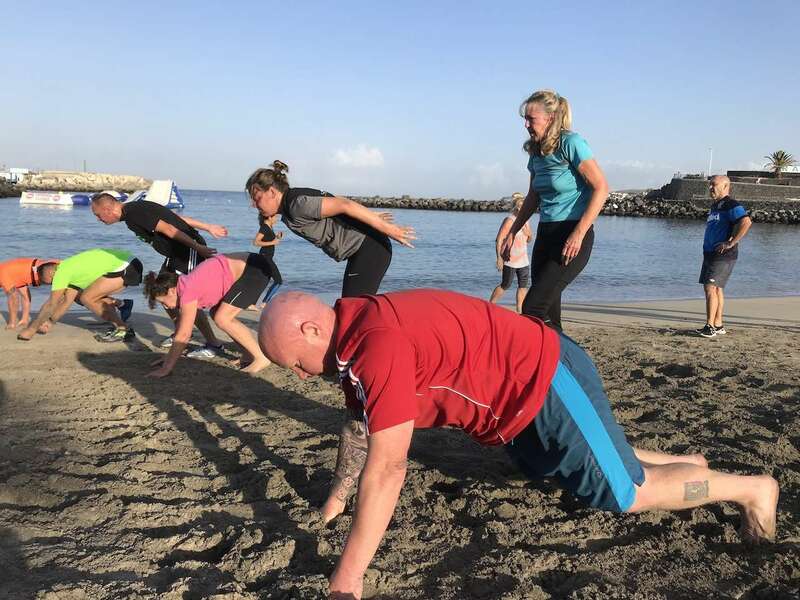 Our Bootcamp Holiday in Tenerife is made up of 3 sessions each day…. all carried out in the morning. After the early morning beach classes we had a healthy breakfast and then moved into the gym for a 10:00 Boxing / Kickboxing Pad Class. This is one of the most popular classes especially with people who have absolutely no background in fighting. Kickboxing pad work is extremely high paced and energetic but also helps build confidence in the person. We work on 2 minute rounds and initially learn basic striking such as punches, kicks, elbows and knees. These are then put together in fast combinations with only a short rest period in between. After each round we do loads of stomach work as building core strength is a major priority in our FITNESS HOLIDAY week. Our final class of the day is KRAV MAGA – A Self Defence System used by the Israeli Special Forces. Again this is a High Intensity Training Session but this time you will learn how to deal with Violent Attacks. For example grabs & strangles, punches & kicks and weapon attacks. This is one class that I believe every single person should try once. Hopefully you never find yourself in these type of situations. However should the day ever come it is extremely beneficial to have a bit of an idea how to react.